As the rate of chronic illness skyrockets, more and more parents are faced with the sobering reality of restrictive diets. And because everyone is busy, many families come to rely on store-bought "healthy" products to make life simpler, but many of these are loaded with sugar and hidden toxins. When faced with her own family health crisis, mother and health coach Leah Webb realized that in order to consistently provide high quality food for her family, nearly 100 percent of their meals would need to be homemade. But when she looked for a resource to guide her, most cookbooks that offered recipes "free" of allergenic foods were also high in processed starches, flours, and sugar. Webb, like so many parents, was looking for a cookbook that offered deeply nutritious, kid-friendly, whole foods recipes that were also easy, but there wasn't one--so she wrote it herself. 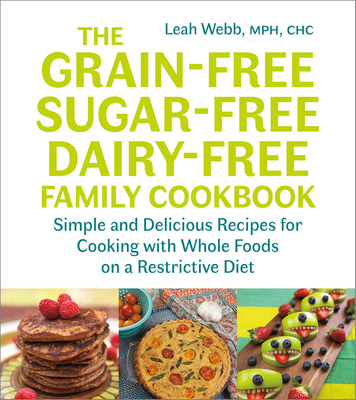 The Grain-Free, Sugar-Free, Dairy-Free Family Cookbook offers a new system to preparing food and approaching the kitchen that gets kids involved in cooking, which encourages excitement around food (a major challenge with restrictive diets). The recipes are rich in healthy fats, nutrient-dense vegetables, ferments, and grass-fed meats, and include snacks, school lunches, and delicious sweet treats that rival the flavors of sugar-dense desserts. By following Leah's meal plans, parents will be sure to please everyone in the family and make cooking on a restrictive diet enjoyable and doable over a long period of time. Families that know they would like to rid themselves of grain, sugar, and dairy, but are intimidated by starting, will find Webb's advice and troubleshooting invaluable. The cookbook outlines family-tested methods that make for effective and efficient preparation, including everyday basic recipes that will become part of a cook's intuitive process over time. The best part is that although Leah prepares nearly every single one of her family's breakfasts, lunches, dinners, and snacks using whole food ingredients, she only spends four to six hours on food preparation per week Through stocking her freezer, prepping the kitchen, shopping and cooking in bulk, and consistently planning meals, this diet plan is not only possible; it is manageable and fulfilling. Prepare for this cookbook to radically change your life.